Talamore Country Club Wedding. What a wonderful wedding at the Talamore Country Club located in Ambler, Pennsylvania. We had so much fun photographing John and Danielle on their wedding day. We began the day at the Bridal Suite for the getting ready portion of the day where we met Danielle and her bridesmaids. It’s part of the day that we enjoy very much as we get to interact with the couple separately and we also get to photograph the details that were carefully chosen by them for their wedding day. The bridesmaids along with the bride are usually getting ready at the same time, which is always a moment of the day packed with so much emotion. We also have a wonderful time photographing the groom and his groomsmen. They are usually a quieter group compared to the bridesmaids, but they are definitely very entertaining.In this photograph, I had the couple stand in the center of the dance floor where I captured them and the grand windows and glass ceiling which was totally amazing. The up lighting provided the photograph a splash of color and dimension to the photo. 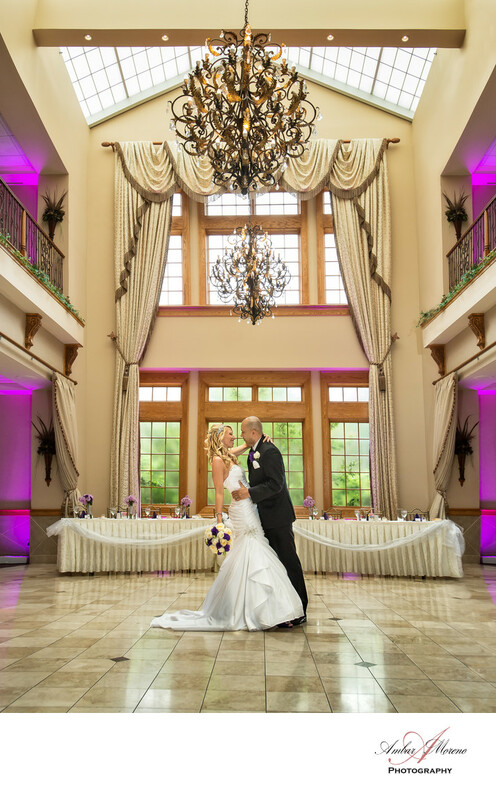 I creatively captured the photograph with my 17-35mm lens from a distance that allowed me to capture the entire scene and where I was still able to capture the facial expressions of the couple.Talamore Country Club is a beautiful wedding venue located in Ambler, Pennsylvania. The gorgeous landscape that surrounds the building and golf courses is simply beautiful. The grounds are beautifully decorated and the ballroom conveys a sense of elegance and a touch of charm. There are many possibilities when it comes to photographing the couple at this venue. Later in the evening, we made sure that we took advantage of the sunset. We’re always looking for that deep blue color sky. It makes for a beautiful backdrop to any photo. On their wedding day, the sky was cloud covered, but it still provided us with a deep blue rich sky that added drama to the photos. As we photograph the couple we are looking for that special light that gives us the mood and dimension where after in a photograph. We’re always looking for the photo opportunities that every venue offers us. We always manage to capture beautiful and unique photos every time. Location: 723 Talamore Dr, Ambler, PA.
Keywords: Ambler (15), Talamore Country Club (15).